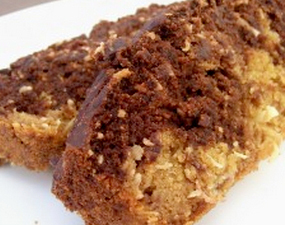 This Gluten Free Chocolate Coconut Banana Bread can be almost anything you want it to be. Versatility is a good thing! The recipe was developed to be a terrific egg-free bread for breakfast, afternoon snack, or even for a quick and easy gluten-free dessert for all my egg allergy and vegan friends. But if you eat eggs, like me, you can simply use real eggs. Sometimes, I like coconut, so threw in some of that, but if you don’t love coconut, simply omit it and carry on! It won’t change the structure of the bread. 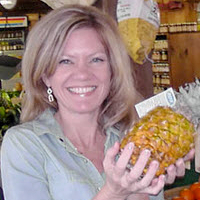 And if you like nuts, you can just toss in up to 1/2 cup of your favorite type, chopped. Or sunflower seed kernels. It’s especially nice if you toast your sunflower seed kernels. Mmmmm… And if you want an “all-banana” bread, just omit the cocoa and bake as directed. Or you can use less cocoa – anywhere from 2 Tablespoons up to the full Monty 1/3 cup that I happen to love (but I love my chocolate treats a little on the dark, bitter side – maybe that’s to balance out my own natural sweetness, Honey Bunch! heehee) So, how’s that for versatility?! Have it your way, Honey Bunch, and always have it gluten-free! Enjoy! In a mixing bowl, combine bananas, sugar, applesauce, melted fat, egg replacer and vanilla; stir to blend. In a smaller, separate mixing bowl, combine flour blend, soda, and salt; whisk. Add dry ingredients (NOT cocoa, it is reserved for a later step) to liquid mixture and stir until batter is smooth. To the remaining batter in your mixing bowl, add the ? cup cocoa. Stir the batter until all cocoa is incorporated; the batter will be very thick and will take a bit of stirring. Spread the chocolate batter over the banana batter in the prepared pan, again, using the back of a spoon to do so. If you like, use a knife to swirl the batter; otherwise, bake 30-40 minutes, or until a toothpick inserted in the center of the bread comes out clean. Cool 20 minutes in the pan after removing the bread from oven. Remove from pan, cool 10 minutes more, then carefully slice and serve.